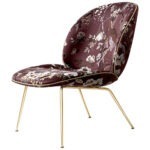 Lounge chair with legs in lacquered metal or covered in several upholstery options. Available with matching or contrasting piping. Also available as a chair and stools. Suitable for contract and high traffic environments. Made in Italy. Please inquire for full list of fabric colors.